There are millions like you out there! 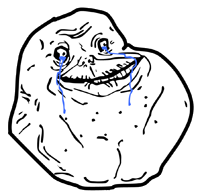 Click to find a new "Forever Alone"
Find me a "Forever Alone"
Searching for fellow "forever alone"s? Look no further. Click to cycle through or if you wish, add them as friends. Oh ya, Happy Valentine Days! The google fonts used were Six Caps and Rancho. Check out more contents over here or you can follow me @p0larboy.